It is very interesting to see a graphical explanation of when each browser came into existence, and what other browsers are in use at the same time period. It is also a very nice example of a presentation. Have a look for yourself at his graphical browser time-line. Sometimes something in life is just funny. Today I went to register my new lenses, a set of “transitions lenses” that tint in UV rays. So what was so funny? 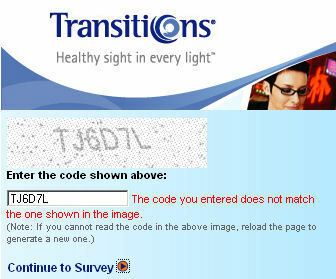 I couldn’t read the captcha they presented me with my fancy new glasses! They don’t zero tint even indoors — this has absolutely no effect on me, I can see fine, but people look at you and think, hmmm, wearing “rose” colored glasses (of course it isn’t rose in my particular case, but it is a very minor tint almost always). They don’t darken when you are in your automobile because the auto glass filters the UV rays. If you have a convertible, no problem, otherwise you need to either roll down the window and hang your head out (it’s cold here today, and bright because of all the snow cover) which isn’t necessarily the best way to stay focused on the road, or you need to take them off and hold them out the window — scared for your life that you may drop them at any second and plus you can no longer see the road because you took your glasses off, duh! You have to wait a minute after going to darker environs for the glasses to un-tint. This is the one everybody always talks about at the eye doctors office, but to me is the least significant. Heck, they’re all steamed up from coming out of the cold weather anyway, and even in sunglasses you can see in most light conditions. So why transitions? Well because I was tired of alternating between losing my clip-on’s and or not having them with me when I needed them. The same would be true if I had a pair of sunglasses (with or without contacts). So this way I have them on and I am good to go. I hope I like them because they were darned expensive glasses (progressive bi-focals, lighter lenses, with transitions and anti-glare coating) and insurance will only help with the cost (AND I DO MEAN HELP) once a year. I save up and buy one eye’s worth in one year and the other in the next year and then I pay the other third. So I cannot do it again for two years. Secunia have reported that more flaws were found in Redhat Linux (633) than in Windows (123), but even a blind man can see it is nowhere near a fair comparison. Redhat is made up of the core operating system, and thousands of third party applications that people can choose to install. (or not). 99% of the 633 security flaws found in Redhat Linux were in the third party applications, only 1% were in the core OS. Windows however, only had 123 bugs, but 96% of them were in the core operating system. Since 3rd party apps are not supplied or supported by Microsoft however, all of their bugs did not get added to the total as they did in Redhat’s case. With regards to Firefox, they also seem to be counting flaws that Mozilla have found themselves. We know they are not doing the same for IE, because Microsoft don’t announce flaws they find themselves. Again, not really a fair comparison. Interesting however, is the patching statistics for IE and Firefox. Microsoft’s best patch result was 85 days to release and only 3 out of 10 flaws patched, verses 5 out of 8 and just over a week for Firefox. Statistics are all good and interesting, but taken in the wrong light, can paint a picture that is dangerously incorrect. I have been frustrated for a bit trying to get mail merge to work in Open Office from OpenOffice.org. I read the help files, and tried very hard to figure out where I was going wrong. You go to tools > options > openOffice.org writer (expand with plus/minus sign) > Mail Merge Email and configure your outgoing mail server there. After doing that, you can test your connection and if it works, you are in business. There are only two steps to the test and you will get green check marks. I was on oOo 2.0 and I got many of them back because of a missing date header it appears. I will update to 2.3.1 which is the current stable release and give it another go to see if that does better. Robert Scoble is a fun act to follow. He looks at things and tries them out. He pushes and pulls and isn’t afraid to look silly for trying. He recently tried a script to export his friends from facebook into a Plaxo contacts list. Facebook promptly suspended his account! Welcome to the club Robert. I was banned as well. My reason? I didn’t use my real name. When I joined (and I must say I really don’t get facebook at all. It seems a waste of time to me) it told me I had to use my real name, so what did I do? I used “My Real Name” as my user name. They didn’t like that apparently and thus banned me. Here is the funny part — I guess it’s funny — they didn’t bother to tell me I was banned. I found out when I went there and tried to log in. I lost all three of my friends I had gained! Terrible. Facebook is entirely free to set the terms of service it wants. It CAN require that you use your actual name (in retrospect when it said you had to use “your real name” I guess they were speaking other than literally. They CAN prohibit you from scraping data with an automated script like Robert was doing. That does not bother me, hey they own the system. 1. I would think it prudent of them to give some advance warning. They apparently did in Robert Scoble’s case, but they did not in mine. I was simply banned and gone. Even in his case, he was presumed guilty until proven innocent I guess you might say. They banned first and didn’t investigate before doing so. 2. They need a reasonable and fast way for you to reinstate if you are interested after committing a sin. In my case, my email address is apparently still banned and several emails saying okay, release my email so that I can register under my actual name have simply gone unanswered and tries to use the address over a period of time show it still banned (I have not tried it lately). Obviously many people apparently do get facebook. Sure I like finding people I have lost touch with via facebook (something I do now on a new account registered under an unrelated email address — geez like who doesn’t have 103 email addresses anyway), but the method of conversation, this whole write on a wall things, it all seems disjointed to me. My other and greater concern is with this whole concept of spending great time and resources putting information, contents, thoughts, contact lists, etc. on a third party site in their complete and unfettered control. Doing so causes me pause. There is a trend this way in business and personal things, but what to do for disaster recovery? I guess Robert will find out. In my case, I just said hi to my three friends the next time I saw them. If I cannot back it up, I don’t waste much time on it. Currently browsing the HTMLfixIT news & reviews article archives for January, 2008.